Overloon, 9 September 2018 – IXON is happy to announce that Routeco has been selected as IXON’s Certified Distributor in the Netherlands. Routeco’s current portfolio of industrial automation and control products fits seamlessly with IXON’s all-in-one IIoT solution. 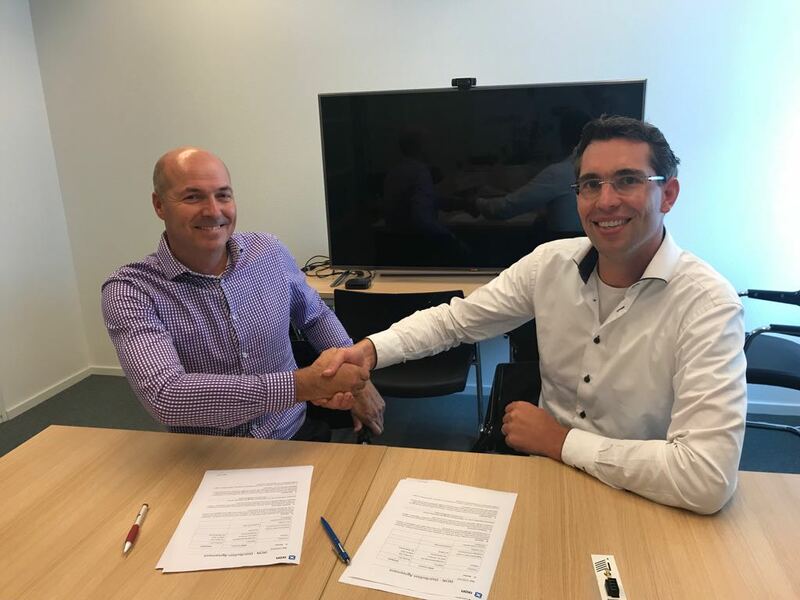 Together we will be working to continue IXON’s exponential growth and to further establish the position as one of the main IIoT solutions in the Netherlands. The partnership is a win-win situation for both parties. IXON can provide better service to its users and Routeco can fulfil the market’s demand for IIoT products. We are convinced that our combined efforts are for the betterment of the Dutch market. Routeco is delighted as well that IXON has selected them as certified distributor. “With this we have set up a promising, future-proof formation. IXON answers the demand for a complete cloud solution from our customer base, which mainly consists of machine builders. And in turn we are able to offer a complete solution along with the other high-quality products and services from our portfolio. “- Luc op den Buijsch, Country Director Netherlands. Luc Op den Buijsch from Routeco (Left) and Willem Hofmans from IXON (Right) shake hands on new Cooperation. Routeco Netherlands has quickly emerged as the appointed distributor with high added value in the field of leading industrial automation. They serve the Dutch market as exclusive distributor of Rockwell Automation (Allen-Bradley), together with high-quality products and solutions from other established manufacturers. Routeco Netherlands is part of the Routeco Group, which has been well-known in Europe for its competence and reliability in the control and automation industry for more than 40 years. IXON is the most secure and user-friendly Industrial IoT solution for machine builders. We aim to help make the world a more productive place with a future-proof all-in-one solution. The robust and compact IXrouter is seamlessly integrated with the powerful cloud-based IXplatform. Future-proof your business by creating new business models, such as pay-per-use and Service Level Agreements. Deliver remote service, monitor your machine, set up alerts, and create high-end data reports. It’s all at your fingertips in your own customer portal.